Impact of the load in the development of VPHP cycles in an isolated line: analysis of a real case (Part 1). 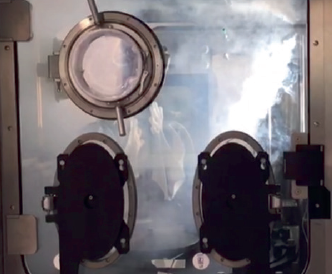 Determined temperature and relative humidity conditions are reached inside the isolator and generator (warm-up phase), before injecting the VPHP in order to achieve a condition in the chamber that maximises the concentration of hydrogen peroxide in a uniform and repeatable way. The 35% solution of H2O and H2O2 inside the VPHP generator is completely vaporised through the “flash vaporization” process and then injected into the chamber until all areas of the isolator have a uniform concentration level. The concentration level is maintained for a determined length of time, known as “killing time”, important for reducing the microbial load (regulations generally set it as ≥ 106). Removal of VPHP from the air and surfaces inside the isolator before production resumes. These phases are validated to demonstrate the effectiveness and reproducibility of the decontamination cycle. The present article analyses, through a practical case, the aspects of developing and validating a biodecontamination cycle with VPHP applied to an IMA aseptic, isolated line, focusing mainly on the choice of load to be positioned in the isolator. The definition of the load is a critical part of the validation process, as it precedes the start of all the VPHP cycle development activities and potentially influences the outcome of the validation. For further theoretical details on this methodology, see the technical article by A. Benassi and G. Cecere “The decontamination cycle with vaporised hydrogen peroxide (VPHP) in isolated filling lines: aspects of development, validation and criticality” – Part. 1 and Part. 2 at https://ima.it/pharma/case-studies/. The article was also published in the ASCCA news no. 2/2017. 3. The material transfer isolator (MTI) allows the entry of consumables during production. The vaporised hydrogen peroxide, generated through the flash vaporization process in the VHP generator, is injected through a system of pipes that connects the generator to the nozzles in the isolator (figure 1 and 2). 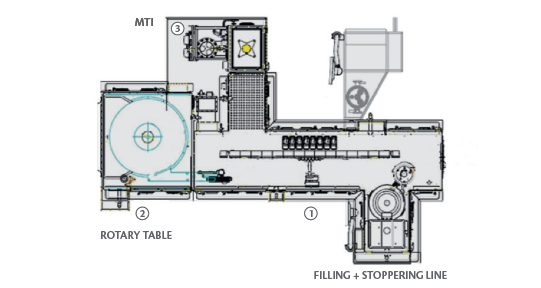 Figure 1: isolated line layout: isolator for turntable, isolator for liquid filling machine, and MTI. The validation of the bio-decontamination cycle with VPHP, called Cycle Development, began at the end of the IQ-OQ of the machines in the line, the isolator equipment and at the end of the engineering activities for defining the cycle parameters. During the engineering tests, the set-points of the decontamination cycle parameters were set in terms of temperature and relative humidity, quantity of H2O2 and relative injection time, in order to uniformly saturate the chamber with the maximum achievable concentration of H2O2 whilst remaining below the dew point throughout the decontamination phase. The purpose of the Cycle development was to validate the decontamination cycle parameters identified during the engineering tests and define the decontamination time needed to reduce the bacteria population by at least 6 Log. Once the decontamination time was identified, the cycle was repeated three times for a performance qualification, to test the reproducibility and consistency of the cycle parameters. Before beginning the cycle development, the “load” to be positioned in the isolator was agreed with the customer. The load is made up of machine parts and all the consumables (Petri dishes for microbiological sampling, cleaning/sanitising cloths, tools, etc.) essential for the customer’s production requirements. An example is shown in figure 3. The composition of the load was agreed well ahead of the validation activities to ensure that all the supports for the various components could be installed inside the isolator. Figure 3: Details of the load: wall supports for hanging quality control consumables (TSA dishes, dish holders) and production tools (cloths, scissors, trash bin). As outlined in the validation approach of the technical article by A. Benassi and G. Cecere “The decontamination cycle with vaporised hydrogen peroxide (VPHP) in isolated filling lines: aspects of development, validation and criticality” – Part. 1 and Part. 2, after defining the load and considering that the system envisaged the VPHP being injected directly into the chamber and downstream of the filters, a smoke test was run to simulate VPHP distribution inside the isolator. After analysing the videos of the smoke test, the areas that needed longer to be fully reached by the smoke were determined (figure 4). Figure 4: the figure shows the inside of the isolator a few seconds after injecting the smoke. The direction the smoke takes is visible and, as time passes, the parts that are reached most slowly by the smoke can be identified. Following the thermal mapping carried out with probes as well as chemical indicators during one VPHP cycle, the points that showed the most thermal variability and a non-significant change in the chemical indicator were considered as challenge locations. The worst case locations inside the isolator were chosen, taking into account the smoke tests and the thermal and chemical mapping as well as geometric factors, the material load and the critical zones for production, in order to obtain a uniform distribution of points over the whole internal surface of the isolator. In this case, a total of 79 locations were chosen and defined. The points were photographed, numbered and documented, as shown in the example in figure 5. Figure 5: the figure shows a section of the isolator with a schematic layout of the locations and a brief description. One chemical indicator and three biological indicators were placed in each of the 79 locations to allow a statistical study based on the MPN (Most Probable Number) and SLR (Spore Log Reduction) and four cycles were carried out, which differed only in the duration of the decontamination phase. The first cycle with the longest decontamination time (70 minutes) complied with the requirements, with no growth-positive biological indicators at any of the worst case locations selected. The second cycle, with 55 minutes decontamination time, complied with the requirements but showed growth of all three biological indicators in location 52BC, despite the chemical indicator changing completely. The third cycle, lasting 40 minutes, showed 2 growths on 3 of the biological indicators, again in location 52BC, with the chemical indicator completely changed. The cycle development was interrupted and the results were analysed. Table 1 shows the results of the cycles.